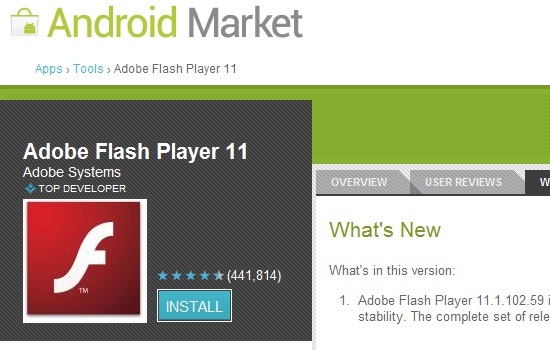 Adobe released Adobe Flash Player 11.1.102.59 as their last major update to the Flash Player update for Android devices on November 13th. The new update brought, “performance improvements and bug fixes related to security and stability”. According to Adobe security patches is all that Android users should expect to see from them for the Adobe Flash Player plugin for Android. Adobe executive in charge of interactive development, Danny Winokur, said in a blog post, “We will of course continue to provide critical bug fixes and security updates for existing device configurations”. Earlier this week reports hit the Internet that Adobe would be ditching their pursuit for Flash Player on mobile devices, Adobe later confirmed those reports in a blog post where the company said they would be focusing on HTML5 and Adobe Air apps going forward. Speaking of Adobe Air the Android specific version of that piece of software has also been updated too. The new Adobe AIR 3.1.0.488 released promises, “performance improvements and bug fixes related to security and stability”, pretty much what the Adobe Flash Player update promises. With Adobe Air Android users can run AIR apps, those apps don’t require your browser but that’s where you’ll have to go find them initially.